Pastor Doris Virginia Heath, 74, longtime resident of Hartford, and widow of the late John A. Heath Sr., passed away at her home on Saturday, January 3, 2009 with her loving family at her side. Doris was born July 10, 1934 in Trappe, MD, daughter of the late Russell and Myrtle (Dudley) Skinner. Pastor Doris was educated in the West Hartford school system. After graduating from Hall High School in 1952, she attended and received her certification from Hartford Secretarial School. She proudly served in that profession for 30 years. She retired from the State of Connecticut Elections Enforcement Commission in 1994. At the age of 17, she met the Lord and was baptized by the late Reverend David Samuel Craig at the Hopewell Baptist Church. She was nurtured by and considered a daughter of Reverend David Samuel and Mrs. Gina Lois Craig. 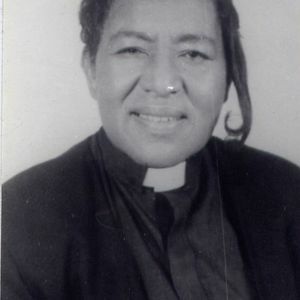 She was one of the founding members of Mount Moriah Baptist Church where she served on the Pastors Aid, Nursing Board, Senior Choir, and served also as an Associate Minister until becoming the Senior Pastor and Founder of the Center of Joy in Hartford. In 1963 Pastor Doris sang with the gospel group Proverbs Gospel Singers that recorded a 45 RPM at Chimes recording Studio, Hartford, Connecticut with the titles: Youve Got the River of Jordan to Cross and Going to Heaven to meet the King. Rev. Doris Heath was a known soloist in the Hartford area and sang several years with Narcissus Hinton. Rev. Doris Heath was called to the ministry in 1966 and finally accepted that call under the anointing of God at Mount Sinai Hospital on Sunday December 21, 1969. She preached her first sermon on Sunday November 8, 1970 at Mount Moriah Baptist Church and received her License to Preach the Gospel on Sunday February 14, 1971. After preaching herself worthy of the call, she was ordained at the Mount Moriah Baptist Church by Pastor Craig with a council composed of twenty-two delegates from twenty churches on August 10, 1973. The life and legacy of Pastor Doris Heath can never be summed up in a few words. She guided her adopted sons, Henry Nelson and Isaiah Ramos to ensure that they completed high school. Pastor Heath ministered to various individuals of all walks of life. Where there was a need she would show up and share her spiritual gifts and did not mind pulling up her sleeves to wash dishes or help with household chores. Give her of the fruit of her hands; and let her own works praise her in the gates. Proverbs 31:31. Pastor Heath is survived by her children: Minister Dorian Harris and fiancé Tyrone Owens, of Broad Brook, Pastor John A. Heath II and wife Candace of Houston; Five grandchildren: Cynnita, Dreisen, Caleb, Langston and John III; One sibling, Ossie Ducksworth of Phoenix, two special young men; Henry Nelson and Isaiah Ramos, and a host of Aunts, Uncles, nieces, nephews, cousins and close friends. She was preceded in death by her grandson Tre Heath; and siblings; Charles Dudley, Russell Skinner Jr., Sonny Skinner and Bernice Skinner.